State Senator Lisa Boscola announced this week that the City of Bethlehem will be receiving state grants totaling $1,542,000 to assist the City of Bethlehem in their efforts to repair the Memorial Pool. At a press conference on Thursday at Bethlehem’s Monocacy Park, Pennsylvania Department of Conservation & Natural Resources Secretary Dunn announced the Wolf Administration’s additional $1 million investment for the project – bringing the total state investment to over $1.5 million. DCNR money is supported by the federal Land and Water Conservation Fund. Senator Boscola was able to assist the City in securing two grants through the Keystone Communities Program totaling $542,000. “The Memorial Pool renovation project ranked as the City of Bethlehem’s highest priority in its 2017 Parks and Pools Plan,” Boscola stated. “Enhancing the park and pool infrastructure in our communities is vitally important. Improving these assets provides a low cost recreational opportunity for our families. Investing in our local pools and parks, improves our quality of life, enhances our communities and makes them more attractive places to live. It is why I am proud to team up with Governor Wolf, Secretary Dunn and Bethlehem to make this project a reality,” Boscola added. Memorial Pool opened on Memorial Day in 1957 and was dedicated as a war memorial. The City of Bethlehem had to keep the pool closed in 2018 and it will be closed in 2019 as construction is scheduled to begin in the Spring 2019. 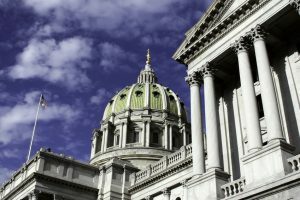 I am pleased to report that Senate Bill 897, my proposal to correct a loophole allowing convicted criminals from paying restitution for their actions, is on its way to Governor Wolf’s desk for his signature. This important piece of legislation will expand the scope of restitution law in our Commonwealth. This is significant because government agencies and non-profits will be entitled to restitution for stolen funds. Before this bill was sent to the Governor, funds that have been stolen from governments and non-profits were not required to be repaid. This common-sense piece of legislation is a product of bi-partisanship cooperation with my colleague Senator Stefano. Crime should never pay and this commonsense fix makes certain it will not. House Bill 2075 will help encourage public utilities to replace outdated and hazardous lead-lined water and sewer laterals for homeowners. I amended the legislation to include language that will provide for more efficient replacement plans and a fair cost for consumers. This legislation will ensure that our sewer and water systems are up-to-date and reduces the likelihood of sewage and lead seeping into the ground water in our communities. A bi-partisan piece of legislation was passed by the House and Senate that makes it illegal to intentionally or knowingly conduct surveillance on another private place with an unmanned aircraft or drone. House Bill 1339, which is now Act 78 of 2018, included language that I proposed. Specifically, my language prohibits drones to be flown over prisons in Pennsylvania to reduce the chance of contraband being delivered aerially into our prisons. This legislation will continue to protect the privacy of citizens in the Commonwealth and it will also ensure that criminals will not be able to obtain contraband that would put our police, correctional officers and other prisoners at risk.